All Forums >> [Artix Entertainment Games] >> [AdventureQuest] >> AdventureQuest General Discussion >> AQ Design Notes >> =AE= Game-Tastic! This week, the entire Artix Entertainment team (from all games) are making game! Read the original Game-tastic design notes post for full details. We just had our kick-off meeting and 9 teams have entered the competition. With only 5 days to for each game to create a game, the pressure is on! (We have a funny idea of what it mans to "take a break".) Ai No Miko is creating a special page where you can see the... bizzarly named teams... and the list of games they are making this week. In addition to the 9 new minigames we are making for you this week -- look forward to the Valentine's Day releases in all games this week! Man, this is so EXCITING! Check out that link! All of the teams are listed, and several have put up stats reports! I'm on the Muscle Tribe of Power and Awesomeness team with Zephyros and The Hollow - and I'm putting our first status report here :-p With luck, we'll start putting them up there later. Much as I hate to say it, we're behind :-( Zephyros is has reached the point where he wanted to finish *yesterday* - which puts us most of an evening behind. So! We have to work FASTER and get through today's stuff TOO! 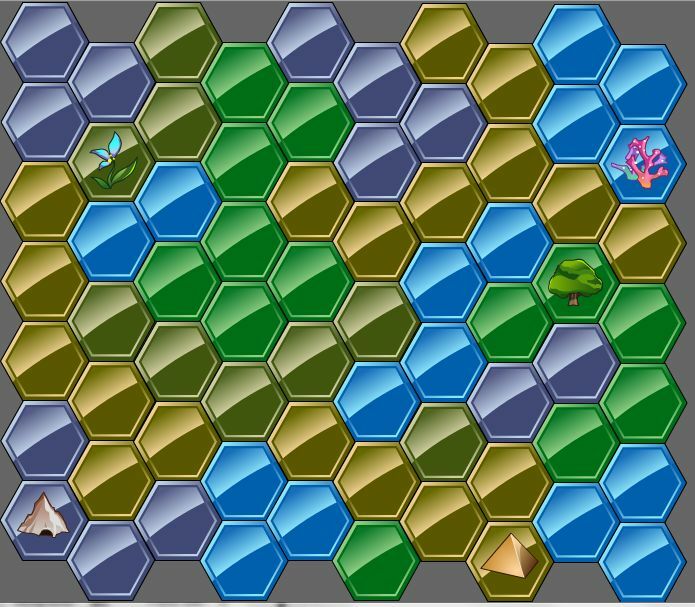 He just finished making the terrain generation work - we now have a pretty colored hex map! 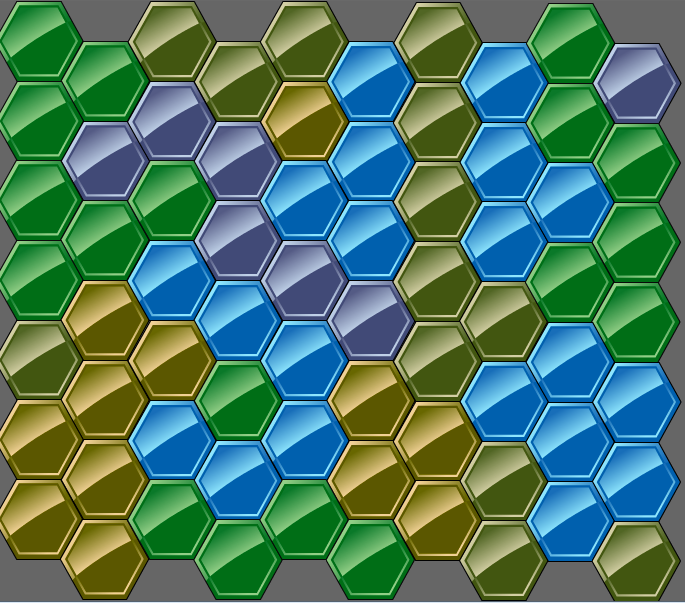 Each of the colors is a different terrain type. Each game will be different because each board is different. When I found out about this contest last week, I started pondering types of minigames I could make. With my character as an archaeologist and treasure hunter, that was an obvious genre. I wasn't quite sure how to make it work, though - but then my roommate suggested an inspiration I hadn't considered. We'd recently played a board game called Tobago which has you running around an island with other treasure hunters in search of clues to a treasure. When you collectively have enough clues to the treasure's location, the first person to make it there finds it and wins. Now, it's no fun to directly copy a game... plus we're doing a single-player game... so I started tweaking the formula from there. I don't want to give away too much right away, but I think we've got something really interesting, and I hope you agree when we're done! Now-- back to work! Instead of using Ustream like some of the participants in other contests have in the past, I'm hanging out in #game-tastic as Aelthai mentioned, and we're talking about all kinds of things as I work, so stop on by. Here we have a prototype board with some landmarks placed! These will be points of reference that the clues can refer to as you're searching for the treasure. End of day 2 for me -- such as it is, I guess, since it's pretty much Wednesday morning -- and while I'm not as far along as I wanted to be we made significant progress today. In the kick-off meeting Artix had some great advice: shoot for a working prototype by the end of Tuesday, and polish from there. Well, we're not quite there yet, but when I was planning I foresaw a few big hurdles that we would have to jump in the early development (one of which is now dealt with - random map generation), so I'm hoping that once the last of these are cleared the rest will be (relatively) smooth sailing.